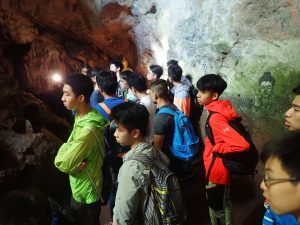 Every year, the school arranges a trip in Chiang Rai for G11 IB Students to carry out CAS through varying activities, and 2018 was no exception. 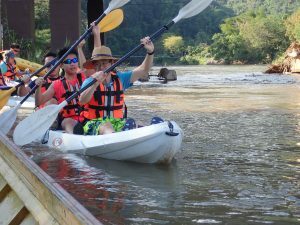 The 8-day trip was packed with activities, allowing students to truly enjoy the suburban life of Chiang Rai. On Day 2, the trip formally began and we kickstarted it with a short decent hike before the exhausting full-day hike on Day 4. This somehow acted as a preparation for us as we only hiked for approximately half a day. 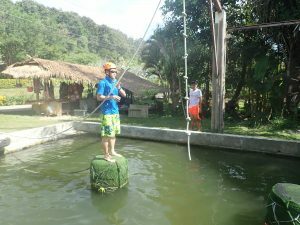 What follows after was the confidence course, which required us to finish certain challenges above water, with the aim being to walk from an end to another end to finish the challenges. This course was challenging, both physically and mentally, as it was not easy for you to reach out your first step. For Day 3, we carried out an English teaching programme by going to a local primary school and meeting the students there. They were very nice, and I could never forget my experiencing of interacting with them. They were all thirsty for knowledge, and they all had the passion for learning, which should be the thing that matters the most. The experience was fulfilling, even though many things didn’t go as planned, but it was always nice approaching and helping the needed. We finished a high rope course in the afternoon. As the name suggests, the high ropes were a few meters off the ground. 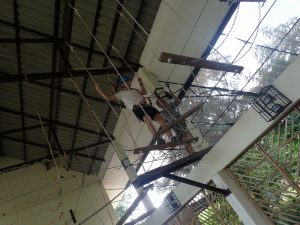 Many people had to overcome their fear of heights and finished the course, even though they struggled a lot at first. For Day 4, we hiked in a place called Fang for the whole day. It was a tough job. It ended up like an adventure more than a hiking (crossing rivers, going into caves etc. ), and it probably will be the most remarkable hiking you will ever have in your life. 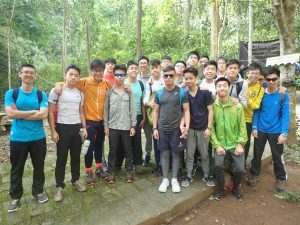 For Day 5, it was a full-day Ecology day after a full-day hiking. We went to two different rivers, one in suburban area and one in the city, to collect samples of living organisms to determine the water quality. This raised our awareness for water pollution and the importance for people to reduce the use of water. All in all, these two days required a lot physical excursion, and dedication to not giving up. For Day 6, I had rock climbing and archery challenges in the morning session. For the rock climbing part, we were supposed to climb a few 4m-tall walls with the help of ropes. Participants who were waiting in line needed to pull the rope in order to stabilise the climber’s movement. It was another challenging activity for those who fear heights and those who are new to rock climbing. Nevertheless, most people held their nerves and finished it confidence and courage. In the afternoon, we went to a construction site as we were supposed to help building up a local school. The job we had was to move the bricks (after solidifying) to a lorry, and then we moved to the second site (the destination), which was a school. The bricks serve as the construction material for the new canteen of the local primary school. Although it was only a very small part of the whole construction, it would have taken the construction workers days to finish the transferring, and we somehow sped the process up. Day 7 would be a treat for you if you had all the exhausting activities in the previous days. This was the last day with full-day activities. I enjoyed my morning as students were distributed in groups and we had to go to a local market to buy groceries and cook dishes to finish a cooking course. The cooking was a lot of fun, and the curry and fried rice tasted absolutely amazing. I spent the afternoon attending a short kayaking course. It involved training in pond. I enjoyed the actual kayaking in a river nearby the resort.